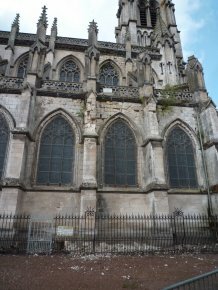 The church of Saint Jacques in Abbeville is located in a neighborhood spared by the bombings which destroyed 80% of the city in 1940. 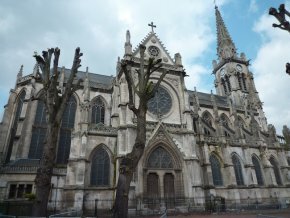 It was built in a neo-Gothic style by the architect Victor Deleforterie, a follower of Viollet-le-Duc, on the site of the previous Medieval church which was demolished as its condition was considered too risky (already ! ), and was consecrated in 1878 (ill. 1). The architectural qualities are plainly visible as seen in our photographs. It well deserved to be listed, or at least ranked, as a monument but city officials over the years never made the request. Over the past few years, particularly since 2005 when a part of the bell tower fell during a storm and made a hole through the roof, the church’s condition has rapidly deteriorated. This has now reached a point where the mayor is seriously considering tearing down the building. Alas, this has become a familiar scenario and is likely to become even more so in the future . 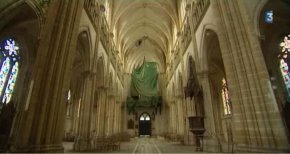 The cost of restoration : in a special report broadcast on France 3 last 19 March (watch here), the deputy mayor states that “in order to save [it], not to reopen it for any kind of activity, it would take at least 10 million euros”, a figure he gave as a low estimate. The mayor repeated this figure in an information meeting for the citizens of the town . We can easily imagine the effect this had on the inhabitants. The danger to the public and the city’s responsibility : located in the middle of a square, the church is close to private homes and a school. According to Jean-Marc Dumoulin, “unless something is done before this winter, there will be a serious accident”. The current condition of the church might, indeed, impress the onlooker : stones are falling off the north wall (ill. 2) with some of these splitting, the walls are crumbling in many spots, one window has lost its stained-glass (ill. 3), apparently broken by falling rocks, and the roof of the nave has a huge opening. Even more, the bell-tower is sinking into the ground. But the only legitimate question worth asking is the following : is the building going to collapse in the very near future, as the mayor claims, or is this grave and imminent danger simply a pretext ? The underlying political stakes in this affair are obvious, with the various parties involved shrugging off responsibility for the current situation. City hall claims that their predecessors did not act, while the opposition accuses the new administration of total inertia since being elected. To be fair, both are probably partly right but we should remember that before 2005, the church was not considered particularly dangerous. Its condition seriously deteriorated after the storm in 2005, a fact admitted by both parties. At that time, according to Paul-Henri Huré, former first deputy to the mayor and in the opposition party today, Vincent Brunelle, chief architect of historical monuments was asked to do a study and report on his findings. This was completed only in October 2008, after the administration at city hall had changed months earlier. The position held today by the mayor and his team is unfounded because the figure of 10 million euros is false : Vincent Brunelle’s report states clearly that the total cost of restoration would be 4.2 million euros and that the project can be spread out over several years with urgent work needed to stabilize the bell-tower, a fact which the mayor did not divulge to the citizens at the meeting. True, the situation has no doubt slightly worsened since October 2008 as claimed by Jean-Marie Hémerlé and Jean-Marc Dumoulin. But whose fault is that ? Since the report was turned in, no repairs have been started and, above all, there has been no attempt to apply even minimal preservation measures. City hall has not tried to patch up the hole in the roof nor the broken window, pigeons fly into the building , water filters in as well, aggravating conditions even further. Contrary to what Jean-Marie Hémerlé and Jean-Marc Dumoulu told us, the hole in the roof had been covered over with a tarpaulin in 2005 ; the frame is still visible. Jean-Marie Hémerlé admitted after we insisted, that it would be possible to stabilize the church at first, then spread out the repairs over several years, but his statements are contradictory. He first claims that at least 2 million euros would be needed for a rescue operation. He then claims that he cannot do anything anyway unless he receives substantial government aid, but without giving precise figures of how much (he said only “at least half of this amount”). Let us remember that this church is not protected as a monument and that this makes it therefore impossible for the government to provide such large subsidies for the project. Finally, Jean-Marie Hémerlé added that bids would need to be received for the repairs and this requires time. His arguments can be summarized as follows : repairs need to be done urgently although a decision will not be made until June, but city hall does not wish, also lacks the needed funds, to do so until this winter ; if nothing is done, there will be an accident. In short, in his opinion, “mass is over” : since it would be impossible to save the church, it must be destroyed. And in fact, city hall has put aside 500.000 € for this purpose. We tried to reach the architect for historical monuments, Vincent Brunelle, several times who finally told us that he “did not wish to communicate to us on this subject.” As he is employed by city hall, his refusal to speak is quite clear. He does not want to state publicly that the restoration is possible and at a much lower cost than that stated by the city. In fact, there is no need for him to say anything further as his report, which he handed over in 2008, is perfectly clear and shows that the church can be restored for a much lower amount than what city hall claims. If his position, as an expert, were the same as that of city hall, there is no obviously no doubt that he would have wished to “communicate”. What exactly is in this report ? It states that the project can be carried out in several stages and that the only urgent matter is “to replace a lock on the gate of the grill around the choir”. Other preliminary measures are also laid out : “establishing a detailed project for technical elements […], detailed diagnostic of the glass, window by window including locks, splays, masonry support and stained-glass, study of drains and drinkable Eauette water pipes .” Have these preliminary measures, recommended in October 2008, been taken ? Obviously not. The report continues. Does the chief architect for historical monuments explain that the church is in immediate danger of collapsing ? Obviously not. He simply points out that the priority, and no one would contradict him, is to take care of the bell-tower and the first bay in the nave “in order to avoid more falling stone and thus repair the roof and the frame under the bell-tower […]”. Five other stages of repairs are then outlined, less urgent, to treat the nave and the transept, the aisles, the choir and the apse. Would all of this cost 10 million euros, maybe more ? Obviously not. The estimate for the first stage is 1.260.115.50 € (the figures are very detailed) before taxes, to which 376.841.21 € should be added, corresponding to fees for the various companies, making a total of 1.636.956.71 €. Since this dates back to 2008, shouldn’t the additional charges of repairing water damage be the responsibility of the current management at city hall which has not done anything for the past eighteen months to patch up the holes in the roof and in the windows ? 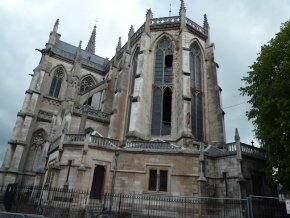 The total amount quoted in the estimate for a complete restoration of the church is 4.200.000 €. This sort of controversy generally leads to exchanges reminiscent of “liar poker”. We asked Jean-Marie Hémerlé and Jean-Marc Dumoulin if we could enter the church. This was refused for safety reasons. After finding out that a television crew from France 3 Picardie was allowed, shortly before we were there, for the broadcast mentioned above, we contacted Pascal Fache, a member of the mayor’s team at city hall who told us that the reporters had come several months earlier and that they had simply been allowed to look in through the door. Both facts are false : they were there six weeks earlier and entered the building as proven by the television reporting  (ill. 4), as confirmed to me by Renaud Parquet on the phone. 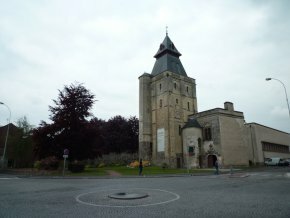 Although the most valuable works in the church, those protected by their listing as historical monuments, were saved and are today held in storage at the Musée Boucher de Perthes (an 18th century lectern – ill. 6, several beautiful 16th century sculptures, including a Christ on the Cross – ill. 7), an Ecce Homo, an Education of the Virgin…), the pulpit and at least one confessional, beautiful neo-Gothic objects, are still there as shown in the France 3 broadcast. The organ, dating from 1906, is also there still. If the clergy no longer sees a use for the church then it would have to serve a new purpose after the restoration. Paul-Henri Huré suggested a solution when speaking to us, perhaps one which might be impossible but which at least deserves consideration. 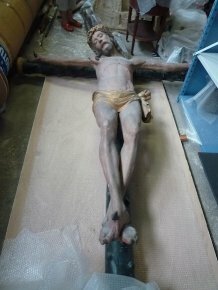 The museum is too small to exhibit all of the collections, notably the Mannessier donation. An extension is in the works for the museum, a disturbing project in fact since, rather than building on the back of the existing structure, listed as a World Heritage site (ill. 7), as initially planned , the addition will be built in front. Funding for the project has already been collected. Either the museum can be used to create a Mannessier museum, or not. In the first case, the money for the museum extension could go to restoring the church and put it to good use. In the second, and if it is really impossible to find funding for the restoration (which we doubt), saving it is obviously more of a priority than building an extension for the museum, which could wait four or five years. Jean-Marie Hémerlé says that Abbeville’s cultural heritage is so vast that it is impossible to attend to it all. Does this mean we should rejoice that the bombings of the two world wars took care of razing a large part of the historical monuments now lost to us, thus eliminating the need to maintain them ? We would all agree that being mayor of a city is no easy task. Then again, no one is obliged to run for office. There are solutions for saving the church of Saint Jacques but they should be enacted immediately. Not far from Abbeville, in Picardie, the village of Brévillers restored its 18th century church while spending only 20.000 € , that is 200 € per inhabitant, corresponding to a population of 100 persons. Abbeville has 24.000 inhabitants which would correspond, proportionately, to 4.800.000 €. This is more than the total estimated by Vincent Brunelle’s report, including even the repairs to water damage in the building. Two hundred euros per citizen, if the repairs are spread out over four years without any government subsidies , represents 50 € a year per inhabitant, or 25 € if the project runs eight years. Couldn’t Abbeville afford to pay this price in exchange for saving an important part of its cultural heritage ? P.S. We point out here a blog highlighting the church as well as an online petition demanding the church be saved. We will soon publish a progress report on endangered churches we have already mentioned in previous articles. The pigeons can be seen on the France 3 television report. The Eautte is a body of water which runs through a canal on the west side of the building, making the land around it unstable and affecting the foundations. In this video, the hole in the ceiling was caused by the fall of part of the bell-tower. Elsewhere, most of the stones on the ground were placed there after being removed from the bell-tower. This project was drawn up several years ago. The total cost of the restoration was 40.000 €, with 20.000 € provided by the Département and the Réserve parlementaire. Not very credible, even if the building is not listed as a historical monument. “Quod non fecerunt barbari, fecerunt Barberini”.